The used Jaguar S-Type model is a luxury mid size executive vehicle that was first sold in the spring of 1999 and continued until 2008. The S-Types models have four doors. The interior is upscale and it can easily seat four adults quite comfortably. The first line of S-Types Jaguars was released from 1999-2002. These models are distinguished by their U-shaped console. They began to have an optional touch screen starting in 2002. The 2005 model's rear and front aprons were redesigned while the grill was slightly modified. The fog lights for 2006 to 2008 models were removed. The S-Types were powered by a number of different diesel and petrol engines. 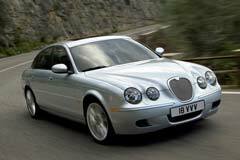 At first, the V8 S-Type had the 4.0L Jaguar V8 engine, and in 2002, its capacity increased to 4.2L. From 1999 until 2002, the rear-wheel drive S-Type models were equipped with a five speed manual transmission; also available was the five speed J-Gate transmission. From 2003, the model was made with a 5 speed manual transmission and a six speed J-Gate transmission which allowed clutch-less manual gear-selection or automatic gear selection. In 2004, the diesel model saw the launch of a 6 speed manual transmission, and also a 6 speed automatic transmission.